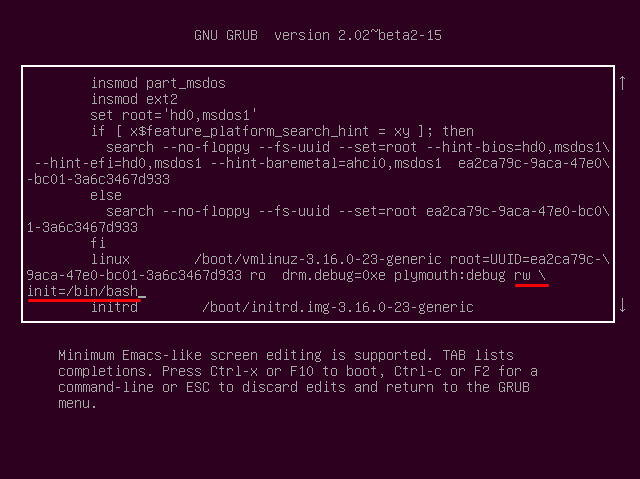 How do I boot into single-user mode from GRUB? After changing a few lines in xorg.conf, I can no longer boot Ubuntu (I assume it breaks when trying to load up X), so I need a way to boot into a single-user mode. However, there seems to be zero guides on the Internet how to do it, because they all assume I can actually edit files on my computer, and I obviously can't. So how do I load Ubuntu in single-user mode? When I turned off splash, I figured out the problem: whenever Ubuntu can't load X server due to some error, it switches to tty1 and waits for the prompt, but doesn't turn off the splash. Change the middle line in (4) by adding the kernel boot parameter single to the end of the line (i.e. after ro quiet splash). Press either Ctrl+X or F10 to boot using these kernel options. Note: These changes are not persistent. Any change to the kernel boot options made this way will only affect the next boot and only if you start that boot by pressing either Ctrl+X or F10 while still in GRUB edit mode. Not sure why the instruction is not permanent. To make it permanent edit "/etc/default/grub"
I changed the line "ro quiet splash "
How can I boot to linux command line from GRUB? How do I boot into true text mode? How to enter single-user mode in Ubuntu 13.04 to install e4rat?